Ron Masak (MAY-SACK) was born in Chicago, Illinois, the son of a salesman/musician (Floyd L.), and a mother (Mildred), who was a merchandise buyer. Ron attended Chicago City College, and studied theater at both the CCC and the Drama Guild. He made his acting debut with the Drama Guild in Chicago in Stalag 17 in 1954. During the course of his career, he has starred in 25 feature films and guest starred in some 350 television shows. 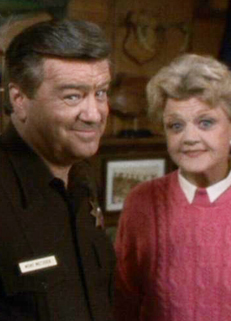 Perhaps the most beloved character, and the one for which he is most famous, is that of Sheriff Mort Metzger on the hit television series, Murder, She Wrote. Given that he has also been seen and heard in hundred of television and radio commercials (he was named, “King of Commercials” by columnist James Bacon), it is no wonder that he is often introduced as one of America’s most familiar faces. Trained in the classics, Ron has proven to be equally at home on stage or screen with Shakespeare or slapstick. He has played everything from Stanley in Streetcar Named Desire and Sakini in Teahouse of the August Moon to Will Stockdale in No Time For Sergeants and Antony in Julius Caesar. As more proof of his versatility, in one production of Mr. Roberts, he played Ensign Pulver and in another he portrayed Mr. Roberts himself. In his hometown of Chicago, Ron was resident leading man at The Candlelight Dinner Playhouse from 1962 to 1966, never missing a single performance. As with many performers, it was the Army that provided Ron with a platform from which to display his all-around talents for performing, writing and directing. In 1960-61, Ron toured the world doing vocal impressions in the all-Army show entitled Rolling Along. Once again, he never missed a show. Never one to be pigeonholed, Ron continued to demonstrate his incredible range of talent in such films as Ice Station Zebra, Daddy’s Gone A-Hunting, Tora! Tora! Tora!, Evel Knievel, A Time For Dying, Harper Valley PTA, Cops & Roberts and The Man From Clover Grove. It was during Clover Grove that Ron added credits as a lyric writer, as he wrote and sang the title song. He played his first big screen villain starring in No Code of Conduct. Among his many television roles, he starred as Charley Wilson in his own summer series, Love Thy Neighbor, Count Dracula on The Monkees and was submitted for an Emmy nomination for one of his ten starring roles on Police Story. He’s been seen on Magnum P.I., Webster and Columbo. His movies of the week include The Neighborhood, In the Glitter Palace, Pleasure Cove, Once An Eagle, The Law and Harry McGraw and Robert Altman’s Nightmare in Chicago. Ron’s variety work includes emceeing hundreds of shows for, among others, Kenny Rogers, Diahann Carroll, Alabama, Billy Crystal, The Steve Garvey Classics, Tony Orlando, The Lennon Sisters, Trini Lopez, Connie Stevens, Billy Davis and Marilyn McCoo, The Michael Landon Classics and The Beau Bridges Classics. Ron is also considered to be the most famous salesman since Willy Loman, as he starred in the four most successful sales motivational films of all time: Second Effort with Vince Lombardi, Time Management with James Whitmore,How to Control Your Time with Burgess Meredith and Ya Gotta Believe with Tommy Lasorda, which Ron wrote and directed. He is a sought after motivational speaker. He has traveled all over the country as spokesman for a major brewing company and for 15 years was the voice of the Vlasic Pickle stork. Ron played Lou Costello in commercials for Bran News, McDonald’s, and Tropicana Orange Juice. Frequently seen on the talk and game show circuit, Ron has been a celebrity panelist on such game shows as Password, Tattletales, Crosswits, Liar’s Club, Showoffs and Match Game. He was a regular panelist on To Tell the Truth. Ron’s private life is also one of varied interests and talents, devoting time and energy working with many charities. For eight years he was the LA host for the Jerry Lewis Telethon and recipient of MDA’s first Humanitarian of the Year Award. He has served as field announcer for the Special Olympics in support of retarded children, and was named Man of the Year by Volunteers Assisting Cancer Stricken Families. In addition, he contributes much time to work with Multiple Sclerosis, Cystic Fibrosis, Breast Cancer Awareness and hosts charity golf tournaments for among others, Childhelp USA, for whom he is a worldwide ambassador. Relaxation for Ron includes time spent with friends on the golf course, tennis court, baseball diamond, ski slopes or at Dodger Stadium. A fine athlete, Ron was once offered a professional baseball contract with The Chicago White Sox. Future projects include Ron starring as Mark Twain in the feature film, Mark Twain’s Greatest Adventure, which he will co-produce, and a one-man show he wrote on Twain called, At Home with Mark Twain. He is currently writing a book entitled, I’ve Met All My Heroes, From A-Z. He recently created the role of Sam Belsky in the world premiere of Jay Kholo’s new musical My Catskills Summer. He is also a very Proud GrandFather, Soon to be 9 grandchildren!!! ….They keep him young!